There are very few things that will get me out of bed at 7:00 a.m. on a Saturday. Among those reasons: a television segment, a flight and probably the fire alarm. St. Patrick’s Day has never before fallen under that category. Luckily I’ve never had to test that theory. 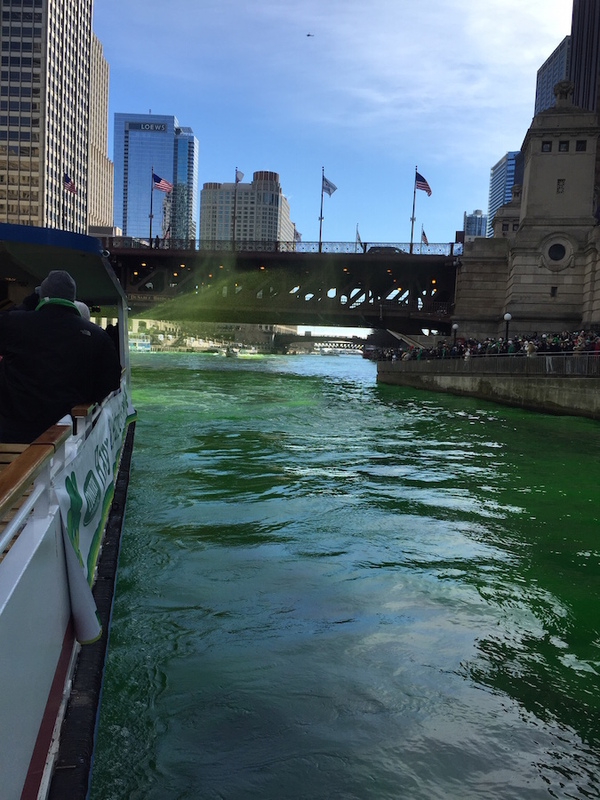 Now we can add a fourth thing to the list: dyeing the Chicago River green in celebration of St. Patrick’s Day with Country Financial. 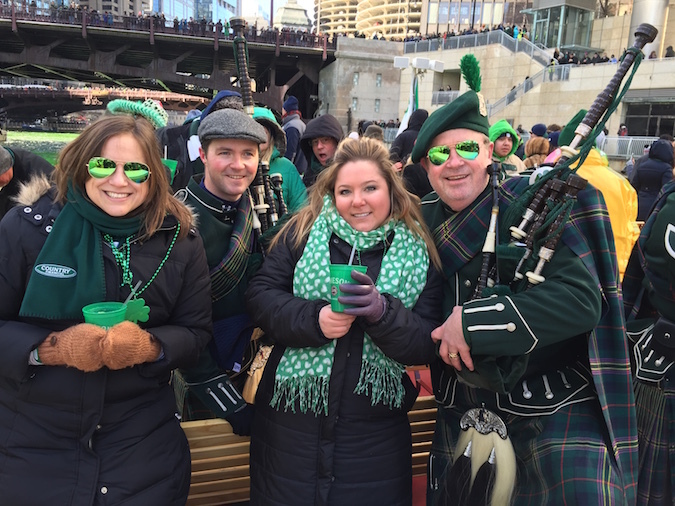 Until this year, I’ve never been to Chicago’s St. Patrick’s Day celebration. For the first couple of years I lived here, I was out of town for the festivities. 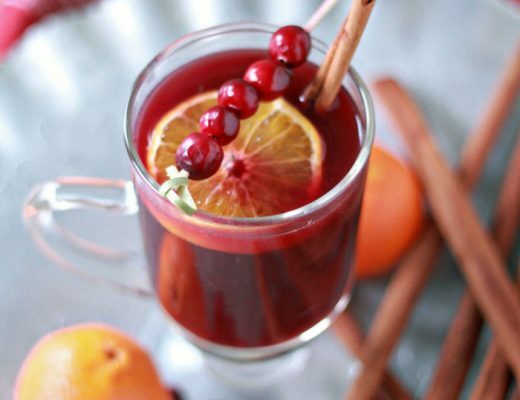 For the past few years, I’ve celebrated with my friends by going out to brunch, or doing some good old fashioned day drinking in the afternoon. I had never been to the river dyeing, a tradition since 1961 that attracts hundreds of thousands of people each year. According to Mental Floss, the Chicago Journeymen Plumbers Local was instrumental in the inception of the tradition. In the early days of his administration as Mayor of Chicago, Richard J. Daley was a man on a mission to develop the city’s riverfront area. There was just one problem: The river itself was a sewage-filled eyesore. 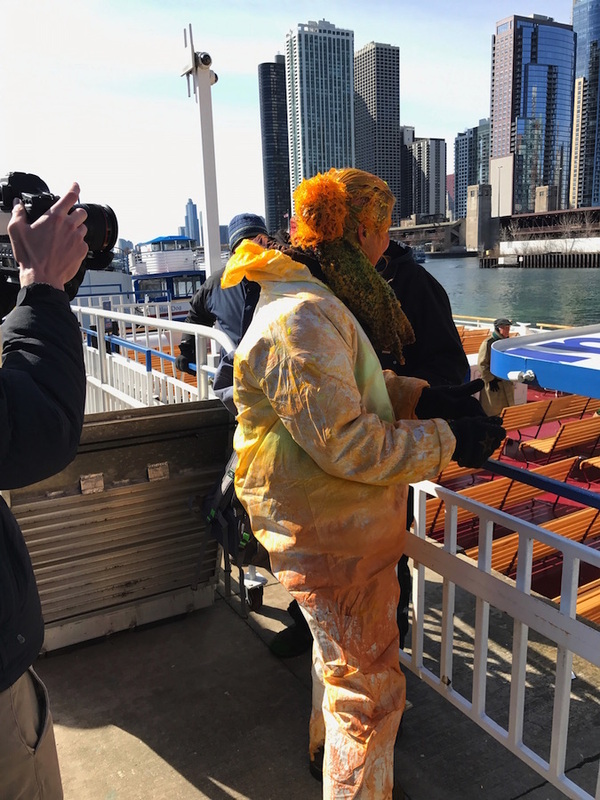 In order to get to the bottom of the city’s pollution problem and pinpoint the exact places where waste was being discarded into the waterway (and by whom), Daley authorized the pouring of a special green dye into the river that would allow them to see exactly where dumping was occurring. 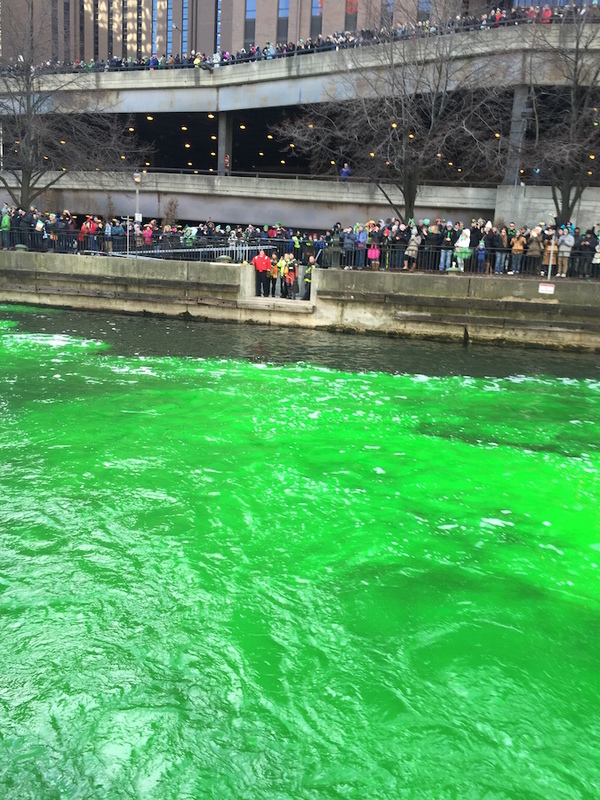 Fast-forward to late 1961 when Stephen Bailey—part of the Chicago Journeymen Plumbers Local, the city’s St. Patrick’s Day Parade chairman, and a childhood friend of Daley’s—witnessed a colleague’s green-soaked coveralls following a day of pouring Daley’s dye into the Chicago River. 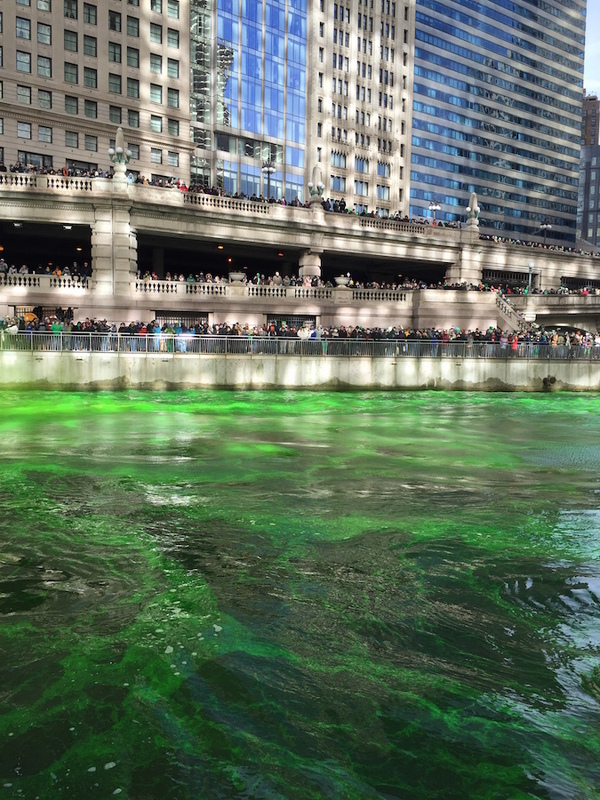 That gave Bailey an idea: If they could streak the Chicago River green, why not turn it all green? This year, a representative for COUNTRY Financial invited me and a guest to join their colleagues on a Shoreline Sightseeing river cruise to help dye the river green. We had front row seats to the festivities and it couldn’t have been more fun. 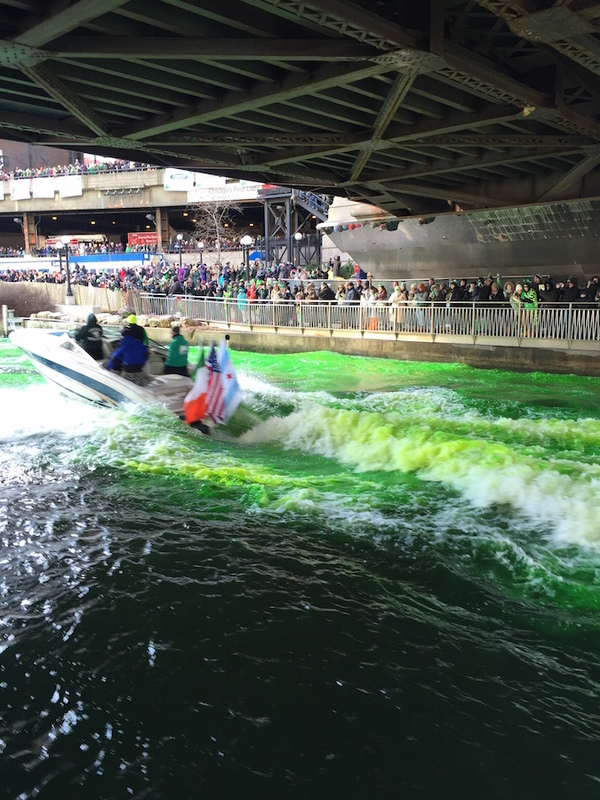 I admit, at first I wondered what an insurance and financial services company had to do with dyeing the Chicago River green. 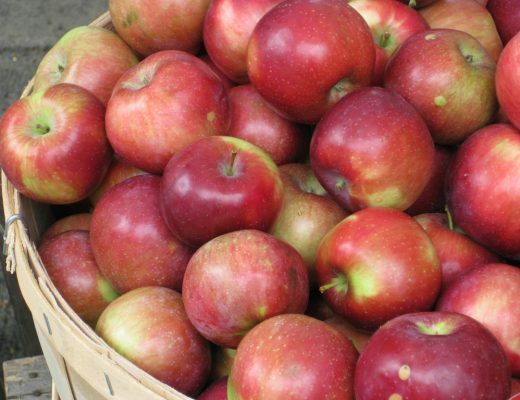 COUNTRY Financial is committed to supporting events and programs that grow and enrich communities and local businesses, from local farmers markets to children’s education initiatives and the Chicago’s local plumbers union (ahhh, NOW I get it). 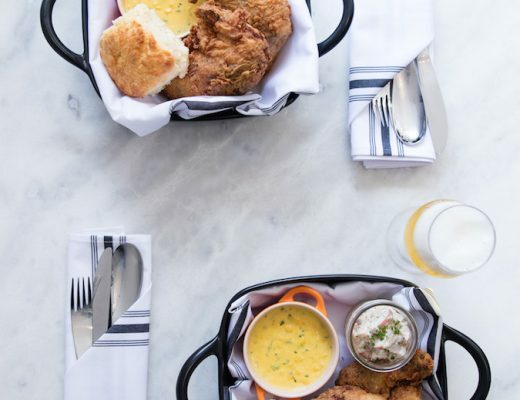 COUNTRY Financial helps Chicagoans and Chicago businesses achieve financial security, offering a full range of products and services to meet insurance and financial needs. 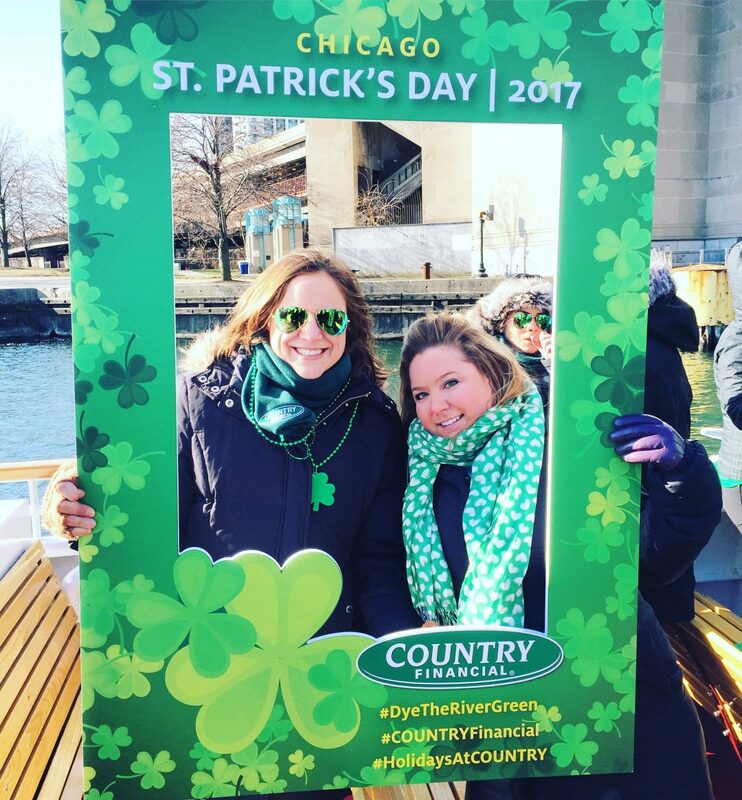 Its employees are also really fun and great at getting into the Irish spirit at 8:00 a.m.
I’m lucky that my own employer truly values culture and community, so it was easy for me to spot the same values in the team at COUNTRY Financial. Because we had to leave the house at 7:30 a.m. on a Saturday morning, Brad gracefully opted out of being my plus-one. My friend Lauren was more than happy to step into his place. Brad called her ‘an upgrade’ from him…so yes, he was gracious. 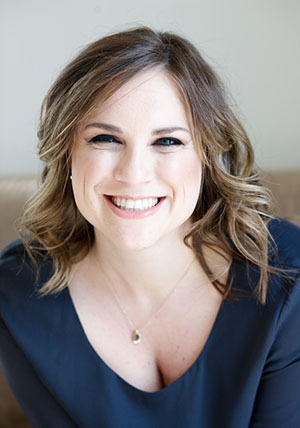 Lauren and I were neighbors in my old building, before I moved in with Brad, and she also has a little chihuahua who she is as obsessed with as I am with Henry. I knew she would be down for some early morning debauchery and she even brought snacks (now you know why we’re friends, rights?). We grabbed a bench on the Shoreline Sightseeing boat that had two benefits — we got “window” side seats so we could take unobstructed photos of the river, and wave at people on the bridges while feeling inappropriately self-important, and also had direct access to the line for the bar, which, let me tell you, was never short. 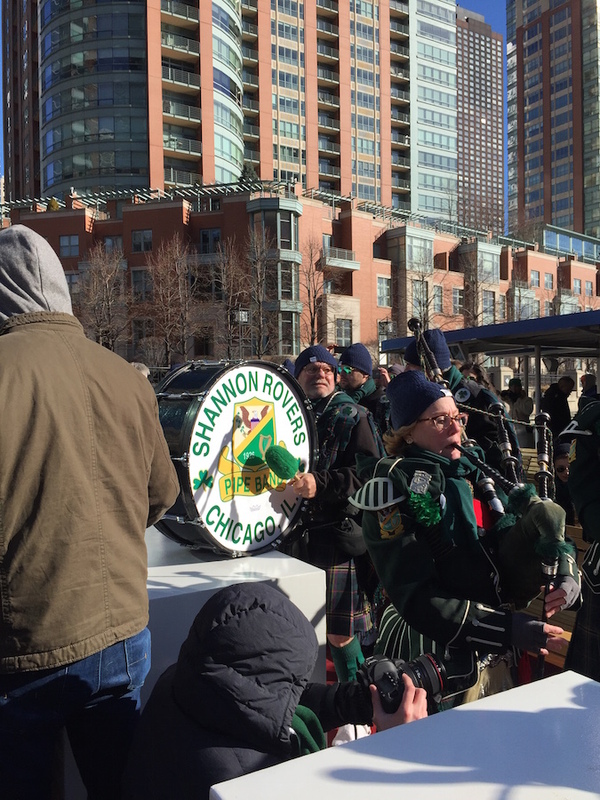 The Shannon Rovers Irish Pipe Band was there to help kick off the celebration. After the river dyeing, they played at almost two dozen bars and restaurants in Chicago throughout the day. This group is something of a cultural touchstone in Chicago itself. It was organized nearly 90 years ago by a group of Irishmen. Most of the founders emigrated from Ireland in the 1920’s, an historical period in Ireland. In 1932, the group began playing bagpipes, because Ireland previously considered them an instrument of war. Fun Fact: the river dye is actually not green until it hits the water. It’s bright orange, and it’s an eco-friendly concoction of vegetable dye. It takes 45 pounds to color the water between Columbus and Wacker drives. 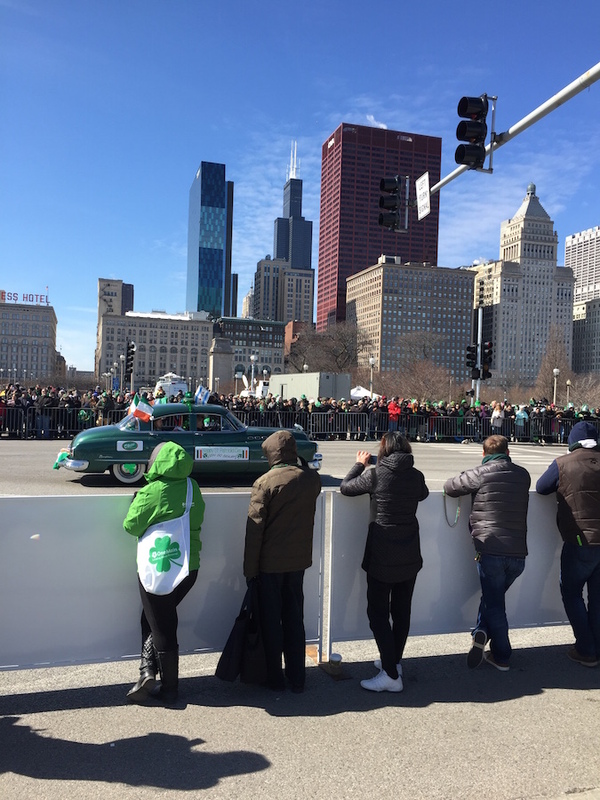 Chicago’s downtown St. Patrick’s Day parade always occurs on the Saturday before St. Patrick’s Day. 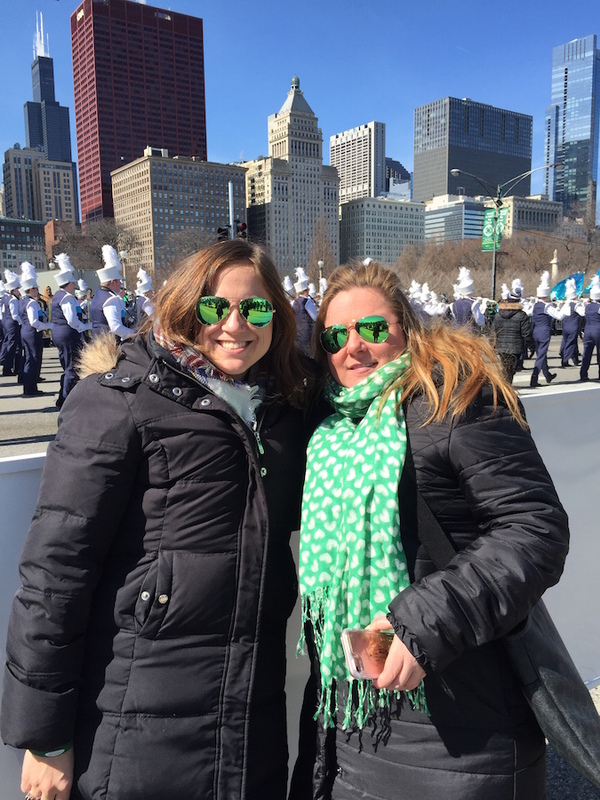 After the river dyeing, we sat front and center on the grandstand at Columbus and Balbo, the start of the parade route (Country Financial even gave us these sweet sunnies!). The Rovers led the parade with bagpipes, which is always a festive way to begin St. Patrick’s Day celebrations. We saw both of our senators and sat right next to the main viewing stand, where dancers and bands stopped to perform. Hundreds of families attended the parade, including a lot of families watching their kids in various marching bands. Even though it was absolutely freezing, we had beautiful views of the city that made the cold completely worthwhile. After the parade, we warmed up at a fun reception at Smith & Wollensky. From the reception, we had beautiful views of the dyed river, more live music and an amazing spread of appetizers, carving stations and cocktails. Let me tell you: there is no better way to take in the St. Patrick’s Day festivities downtown. It was amazing to partake in an iconic Chicago tradition without getting pushed, stepped on or sprayed with beer. Above that though, the festivities served as yet another reminder of how much the people here truly love Chicago. I’m sure people have pride everywhere they live, but it’s different here. Chicagoans have history and pride in their city which only makes me love it more. Brad says he can’t imagine living anywhere else, yet I disagree with him., I imagine eventually living in a warmer climate, or maybe having a home by the beach. Then on days like today, I can’t imagine living anywhere else either.